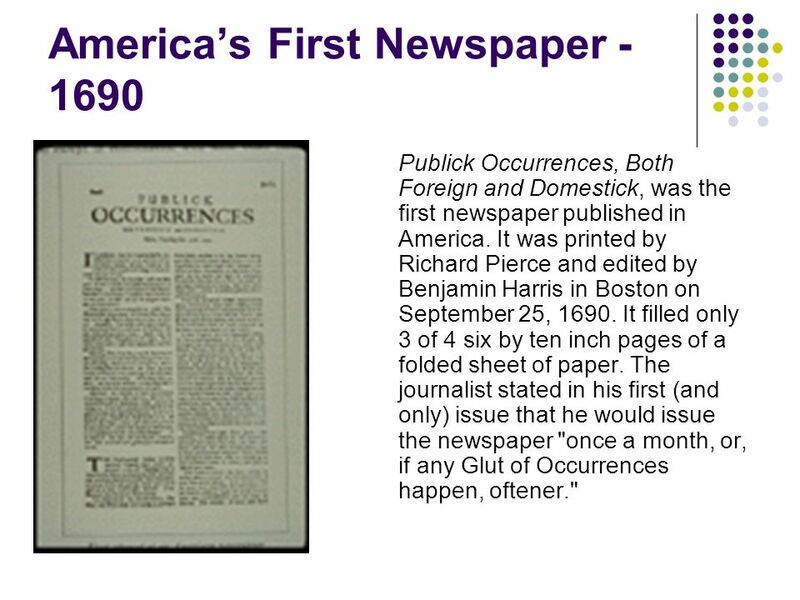 Publick Occurrences, Both Foreign and Domestick, was the first newspaper published in America. 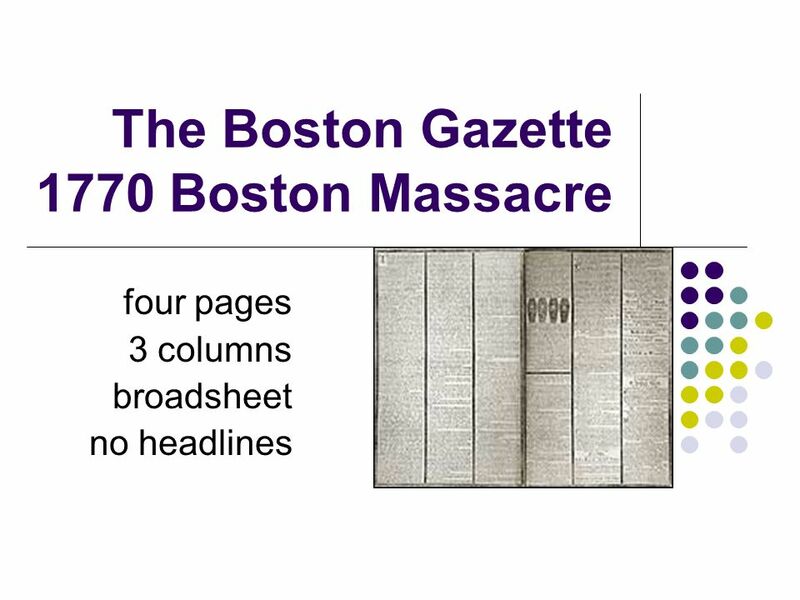 It was printed by Richard Pierce and edited by Benjamin Harris in Boston on September 25, It filled only 3 of 4 six by ten inch pages of a folded sheet of paper. 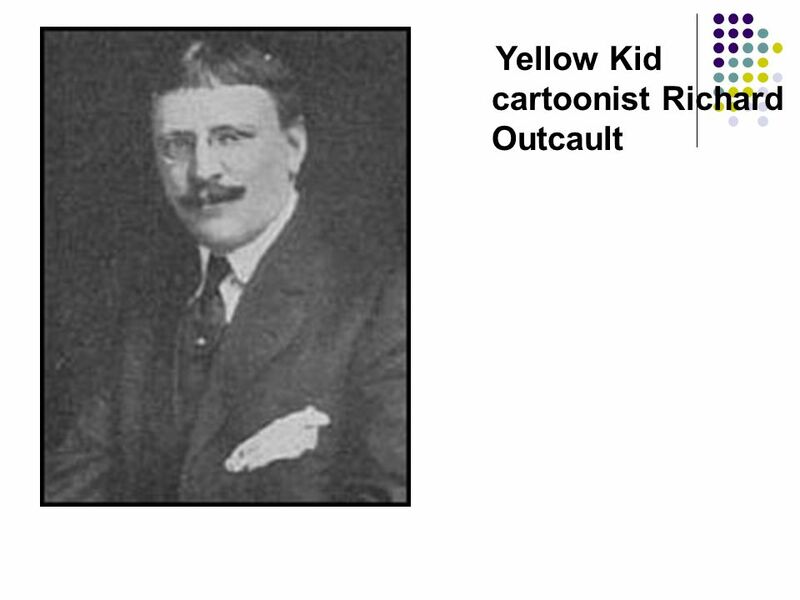 The journalist stated in his first (and only) issue that he would issue the newspaper "once a month, or, if any Glut of Occurrences happen, oftener." 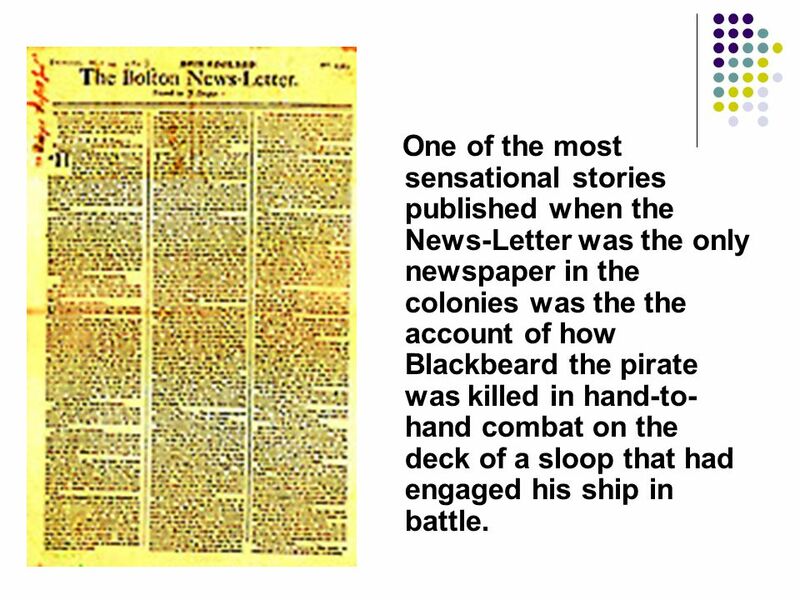 4 One of the most sensational stories published when the News-Letter was the only newspaper in the colonies was the the account of how Blackbeard the pirate was killed in hand-to-hand combat on the deck of a sloop that had engaged his ship in battle. 6 Paper Size was 10 X 15 Most had four pages and measured about 10 X 15 inches. 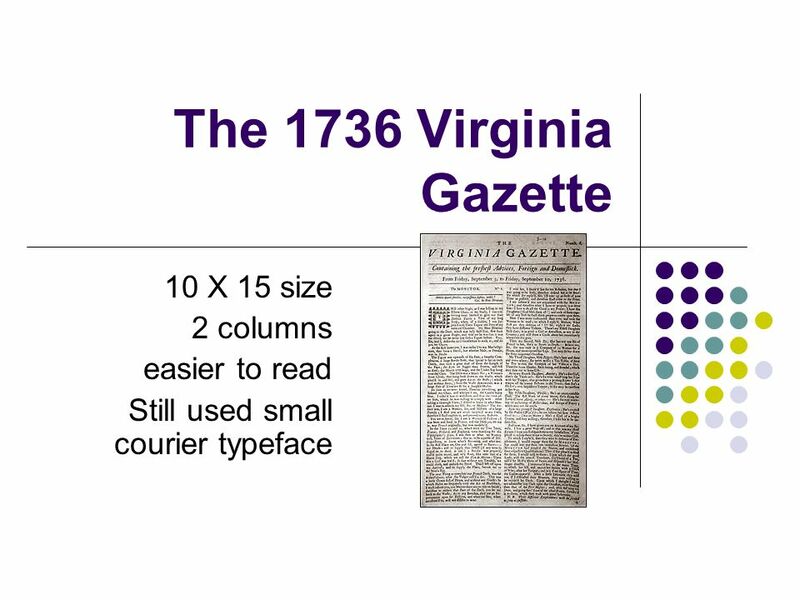 A letter size sheet of paper today measures 8 ½ X 11. 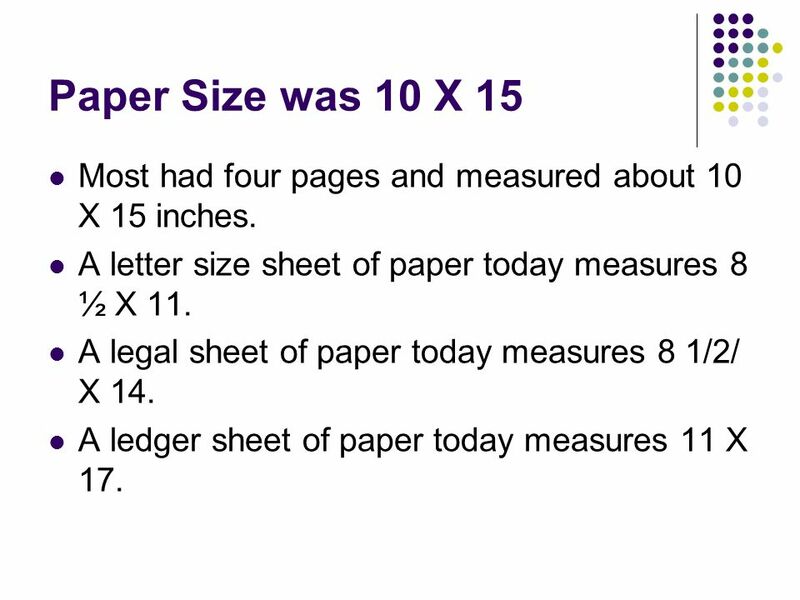 A legal sheet of paper today measures 8 1/2/ X 14. A ledger sheet of paper today measures 11 X 17. 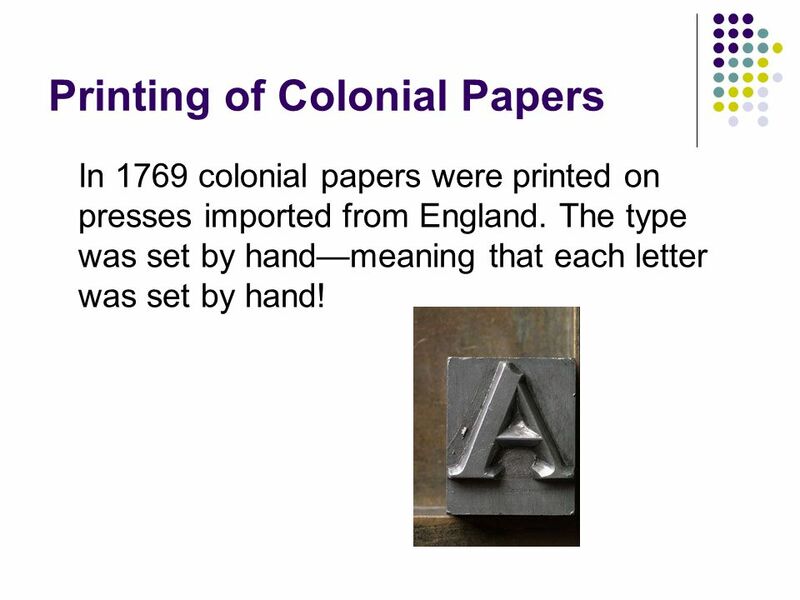 In 1769 colonial papers were printed on presses imported from England. The type was set by hand—meaning that each letter was set by hand! 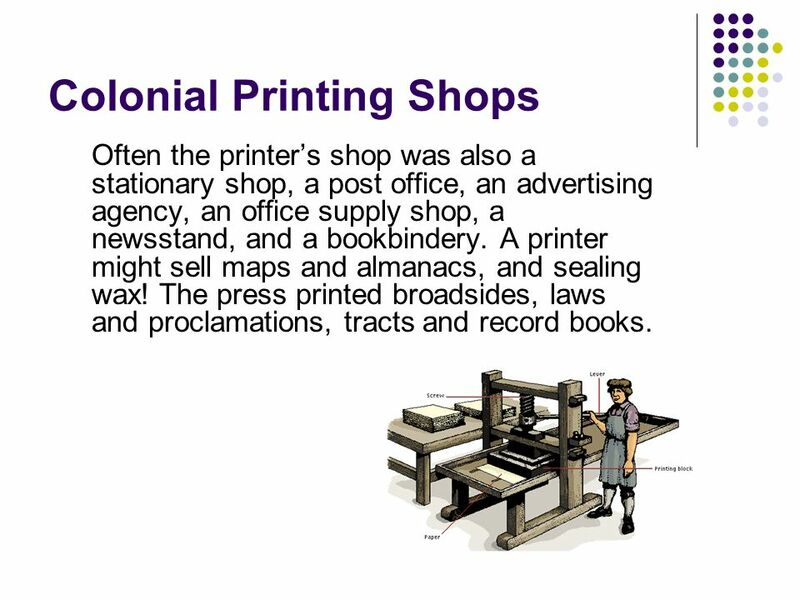 Often the printer’s shop was also a stationary shop, a post office, an advertising agency, an office supply shop, a newsstand, and a bookbindery. A printer might sell maps and almanacs, and sealing wax! 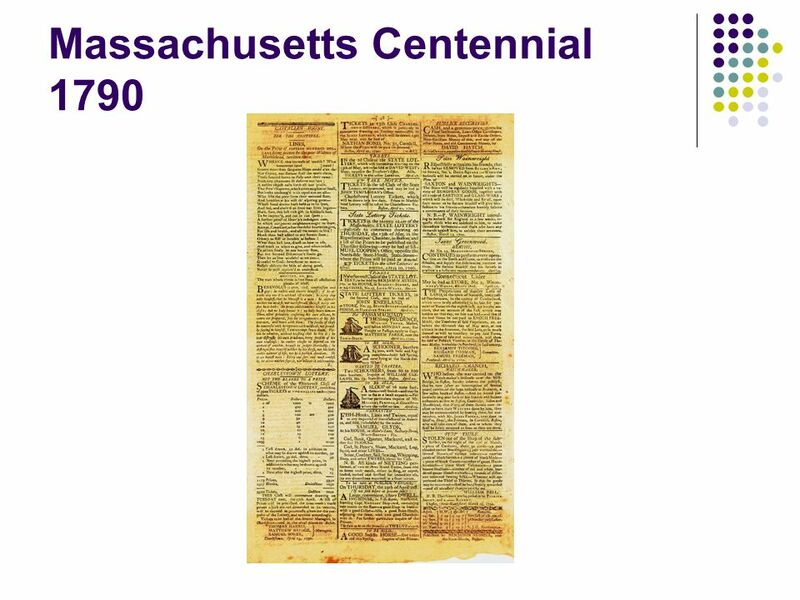 The press printed broadsides, laws and proclamations, tracts and record books. 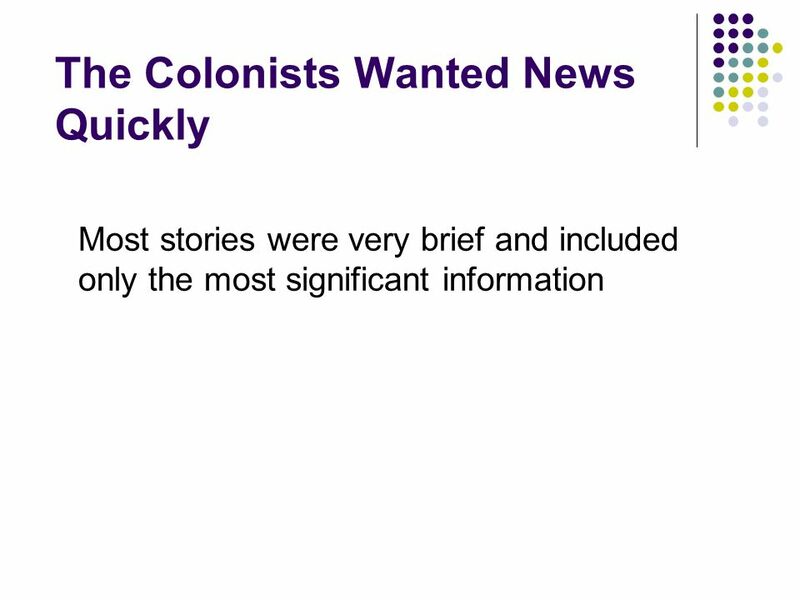 10 What was INSIDE of the Colonial Newspapers? 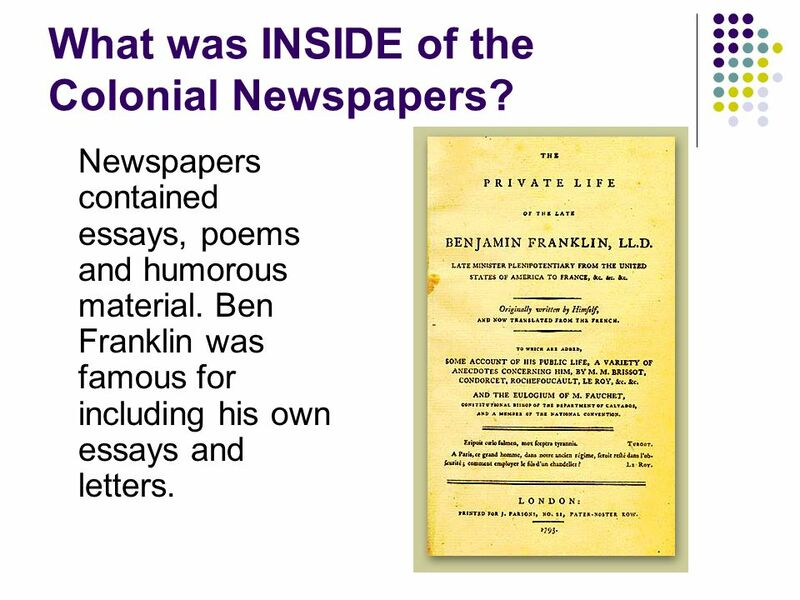 Newspapers contained essays, poems and humorous material. 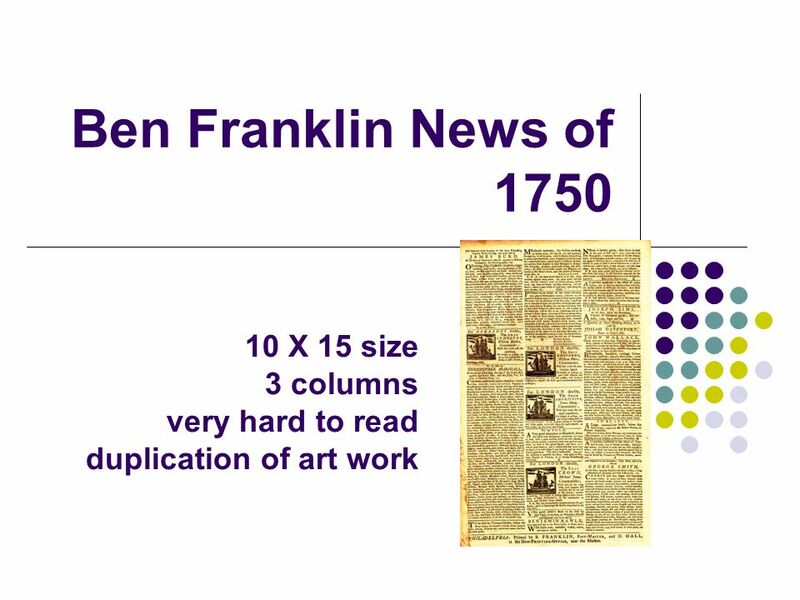 Ben Franklin was famous for including his own essays and letters. 11 Sensationalism News stories included those that would be considered sensational or scandalous by today’s standards. 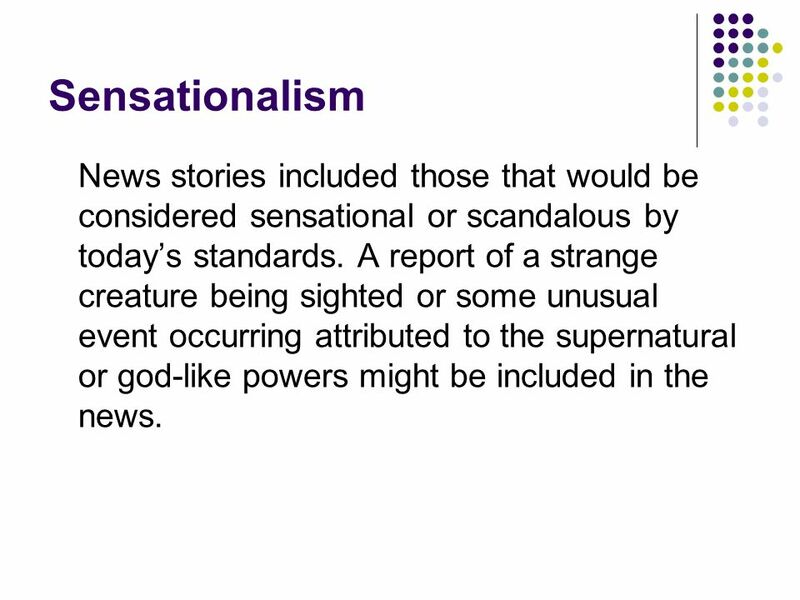 A report of a strange creature being sighted or some unusual event occurring attributed to the supernatural or god-like powers might be included in the news. 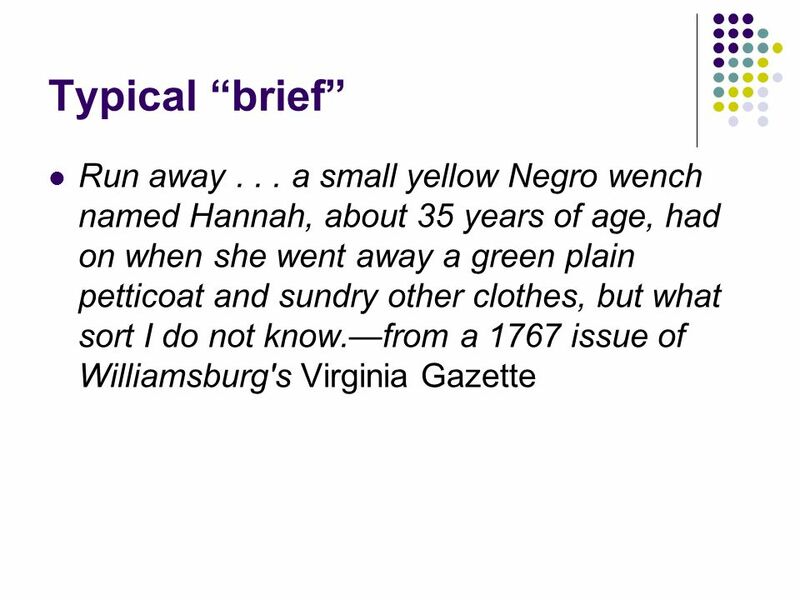 18 LIBEL and Zenger Perhaps the most famous name in early American journalism is that of Peter Zenger. 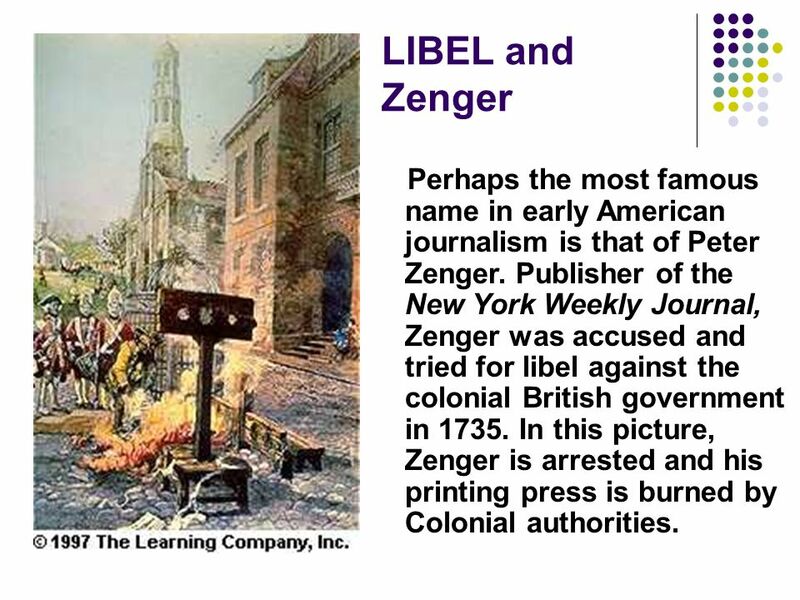 Publisher of the New York Weekly Journal, Zenger was accused and tried for libel against the colonial British government in In this picture, Zenger is arrested and his printing press is burned by Colonial authorities. 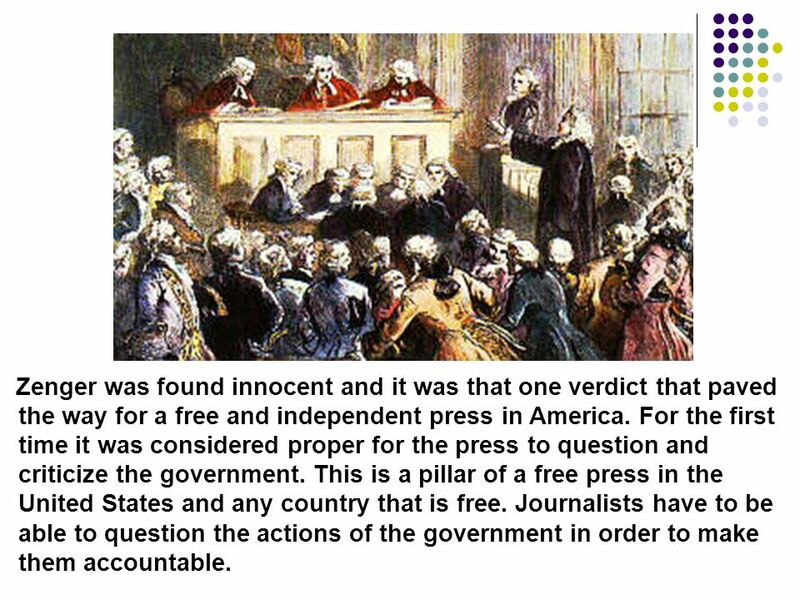 19 Zenger was found innocent and it was that one verdict that paved the way for a free and independent press in America. For the first time it was considered proper for the press to question and criticize the government. This is a pillar of a free press in the United States and any country that is free. Journalists have to be able to question the actions of the government in order to make them accountable. 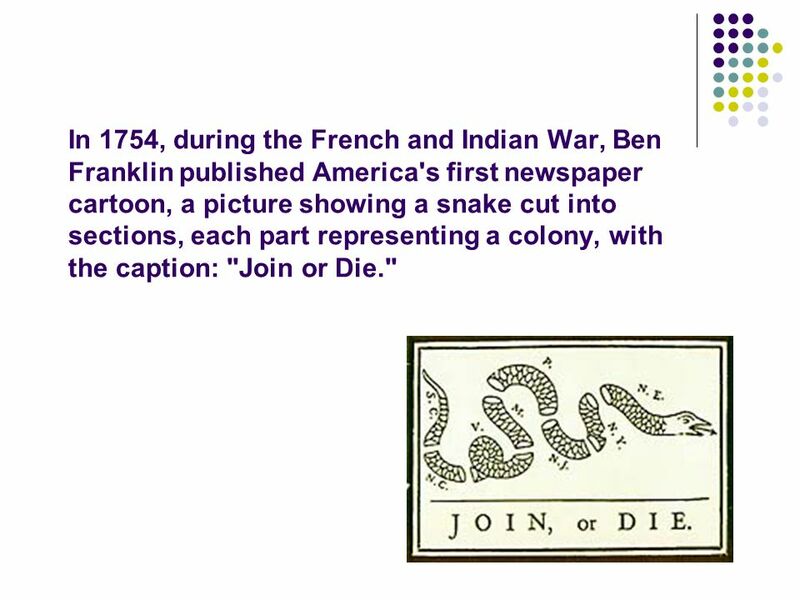 20 In 1754, during the French and Indian War, Ben Franklin published America's first newspaper cartoon, a picture showing a snake cut into sections, each part representing a colony, with the caption: "Join or Die." 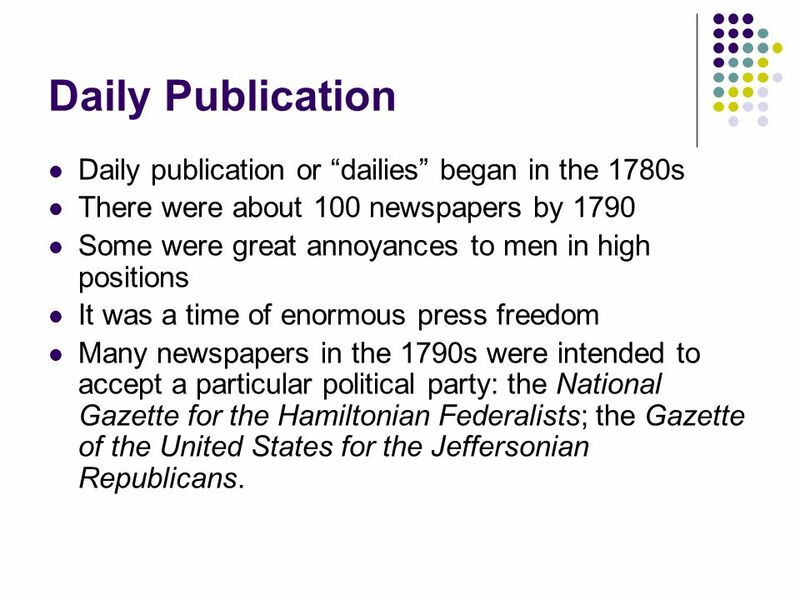 There were about 100 newspapers by 1790 Some were great annoyances to men in high positions It was a time of enormous press freedom Many newspapers in the 1790s were intended to accept a particular political party: the National Gazette for the Hamiltonian Federalists; the Gazette of the United States for the Jeffersonian Republicans. 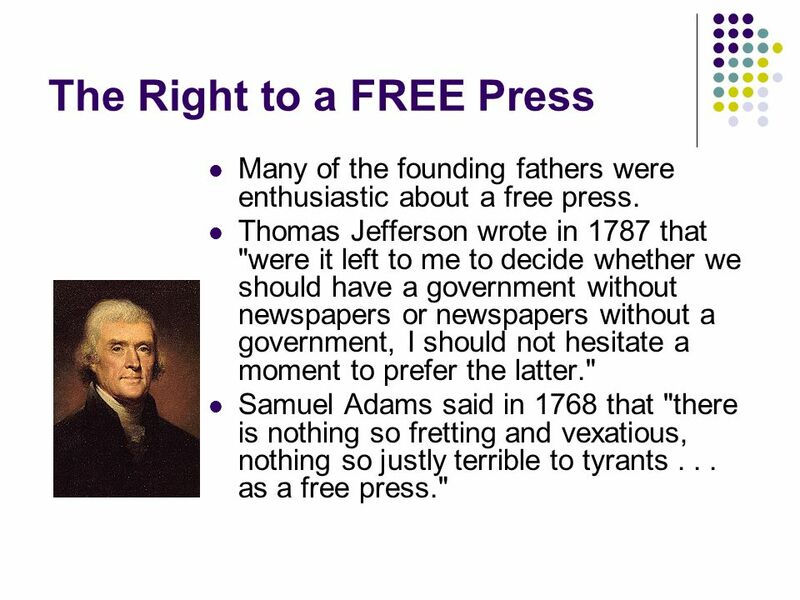 Many of the founding fathers were enthusiastic about a free press. 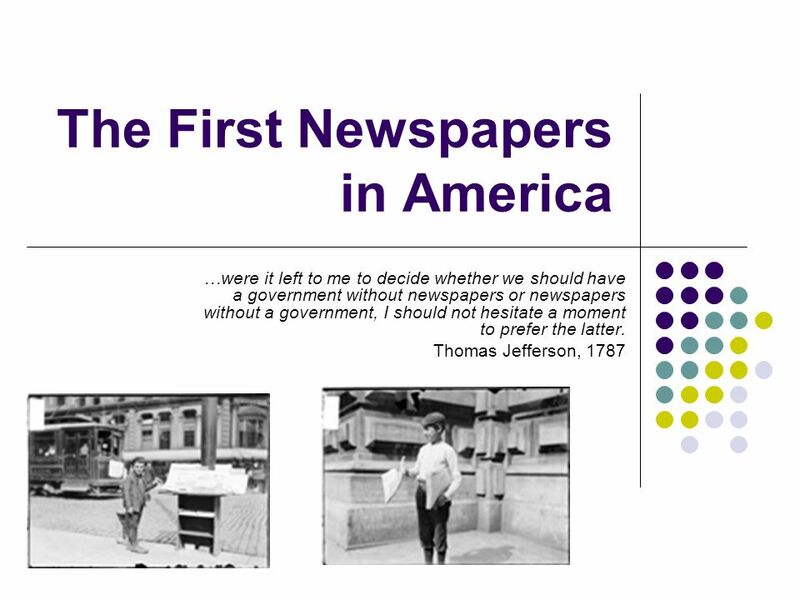 Thomas Jefferson wrote in 1787 that "were it left to me to decide whether we should have a government without newspapers or newspapers without a government, I should not hesitate a moment to prefer the latter." Samuel Adams said in 1768 that "there is nothing so fretting and vexatious, nothing so justly terrible to tyrants as a free press." 27 All that is needed for newspapers to become a mass medium is a good idea. 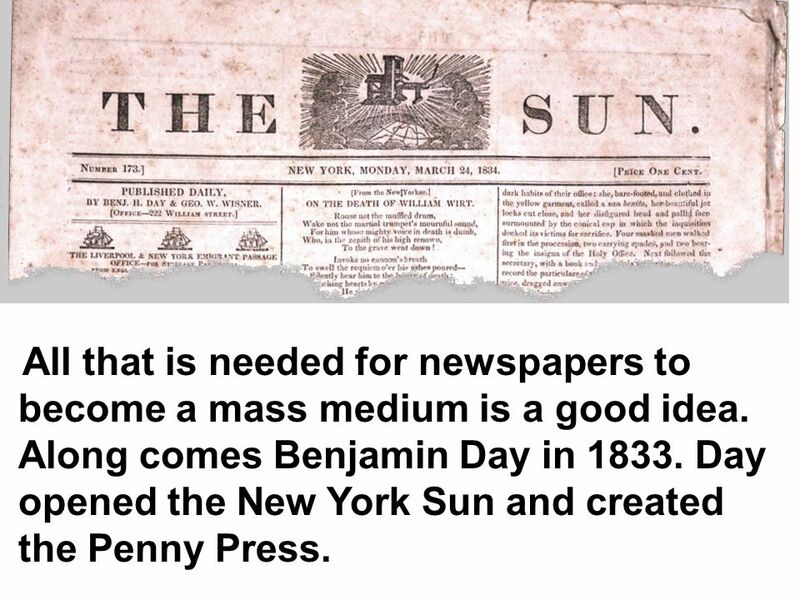 Along comes Benjamin Day in Day opened the New York Sun and created the Penny Press. 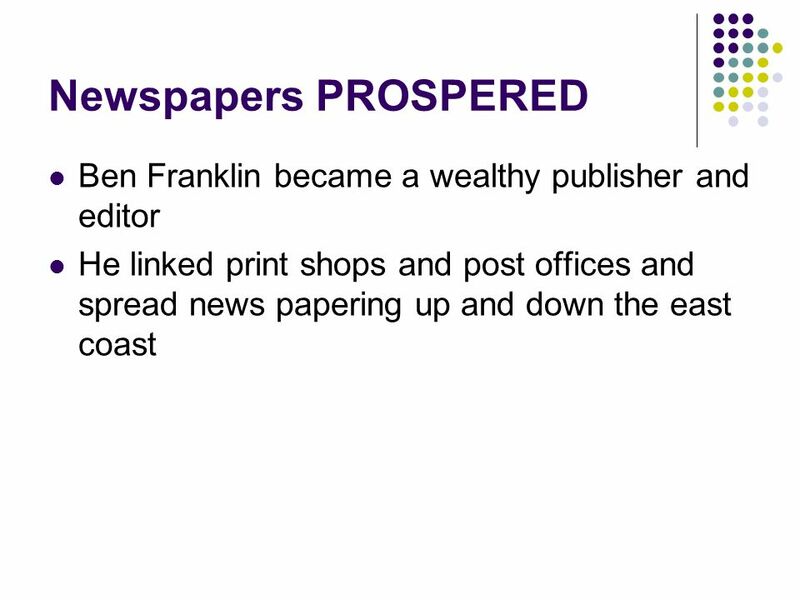 Newspapers of the day cost about 10 cents each too expensive for the masses. But there was a large literate audience out there. 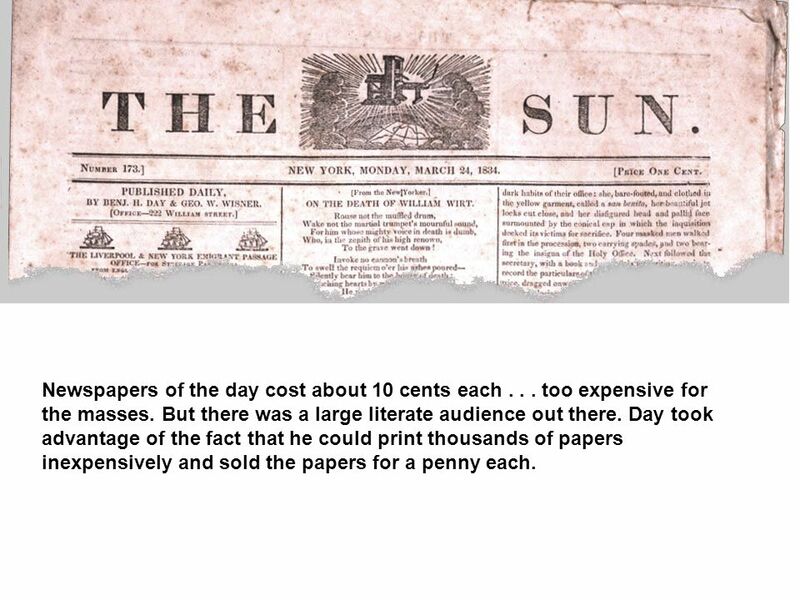 Day took advantage of the fact that he could print thousands of papers inexpensively and sold the papers for a penny each. 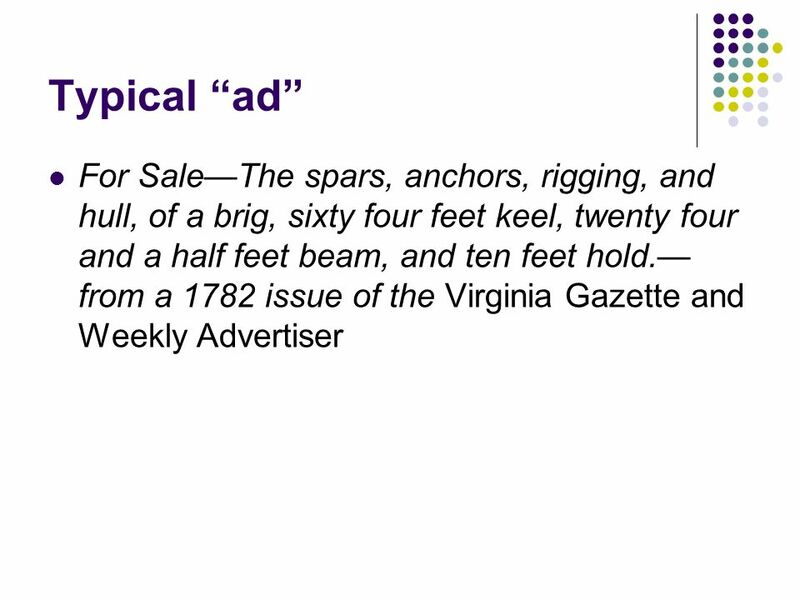 29 The Civil War era brought some “new” technology to the publishing industry. Photography became a popular addition to newspapers. 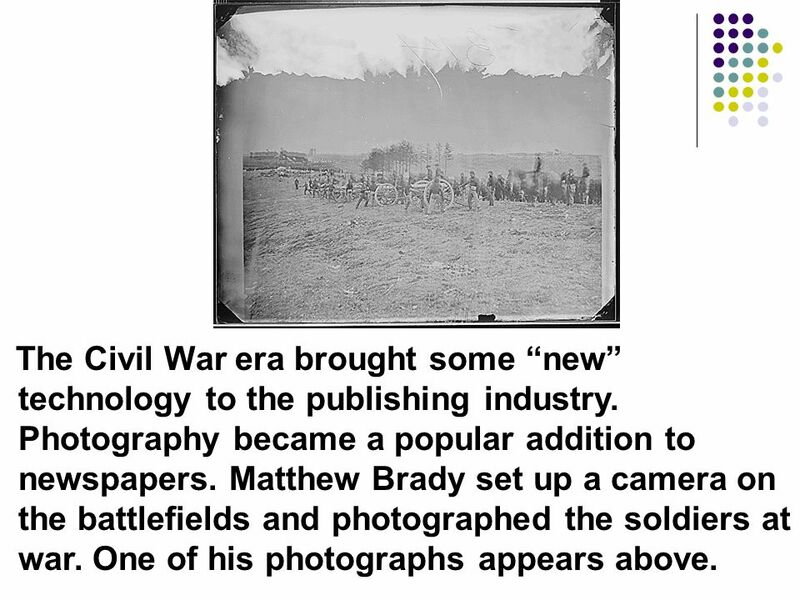 Matthew Brady set up a camera on the battlefields and photographed the soldiers at war. One of his photographs appears above. 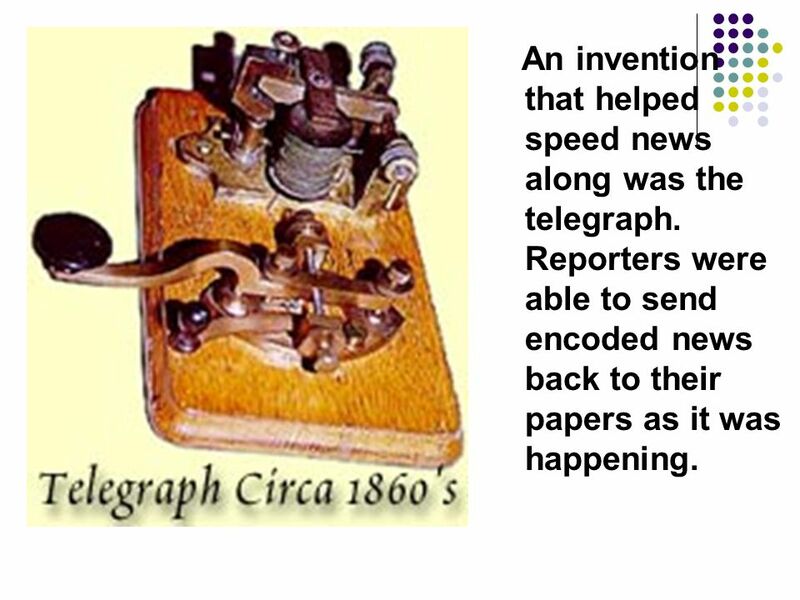 An invention that helped speed news along was the telegraph. Reporters were able to send encoded news back to their papers as it was happening. 31 To alleviate the situation of getting cut off in mid code, reporters developed the “inverted pyramid” form of writing, putting the most important facts at the beginning of the story. 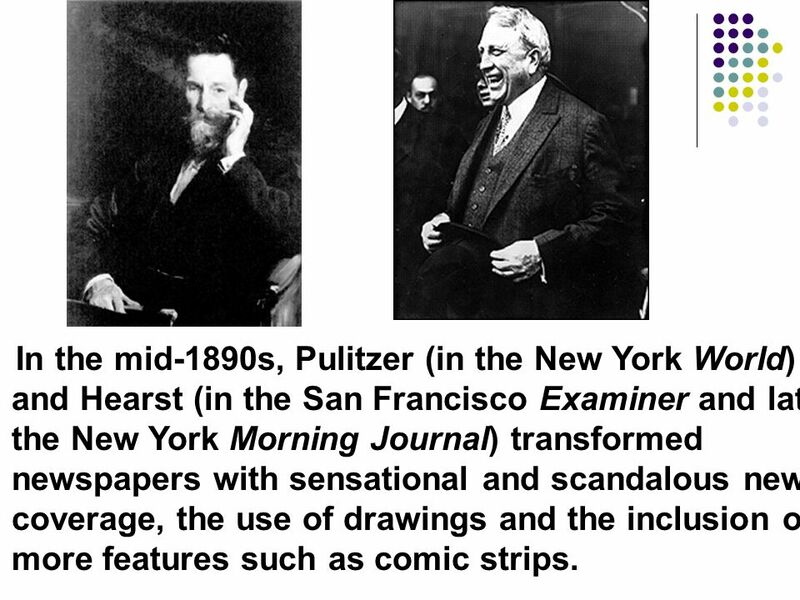 32 In the mid-1890s, Pulitzer (in the New York World) and Hearst (in the San Francisco Examiner and later the New York Morning Journal) transformed newspapers with sensational and scandalous news coverage, the use of drawings and the inclusion of more features such as comic strips. 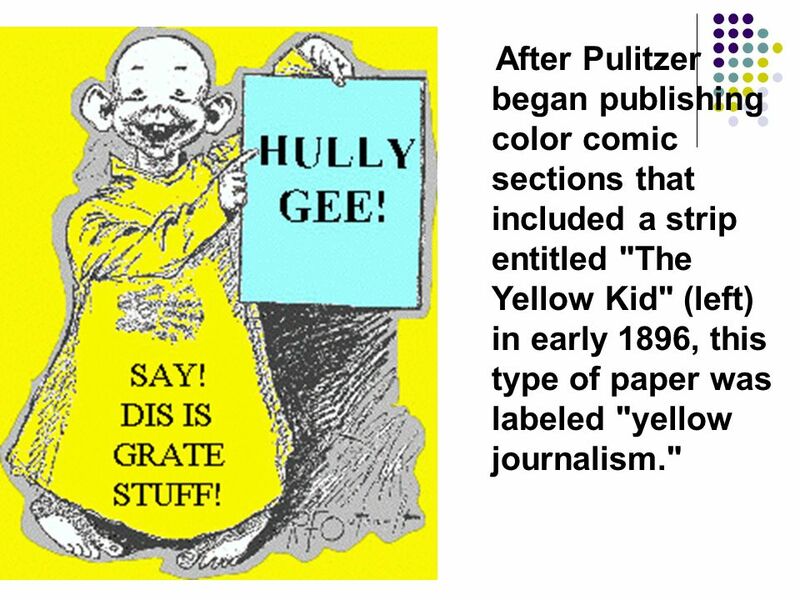 33 After Pulitzer began publishing color comic sections that included a strip entitled "The Yellow Kid" (left) in early 1896, this type of paper was labeled "yellow journalism." 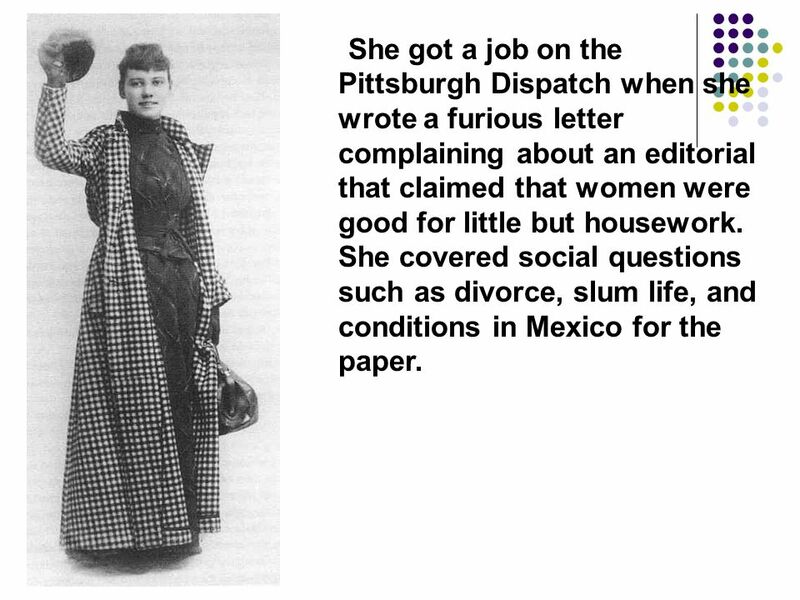 35 She got a job on the Pittsburgh Dispatch when she wrote a furious letter complaining about an editorial that claimed that women were good for little but housework. She covered social questions such as divorce, slum life, and conditions in Mexico for the paper. 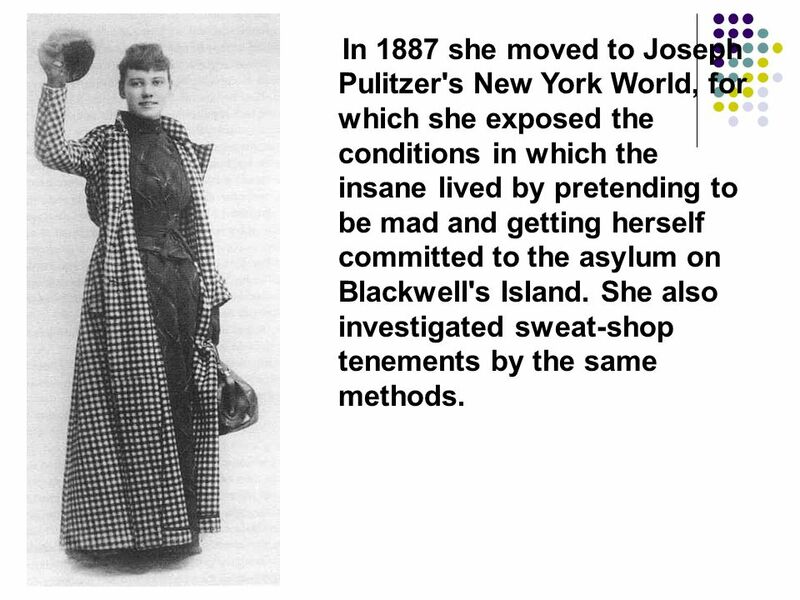 36 In 1887 she moved to Joseph Pulitzer's New York World, for which she exposed the conditions in which the insane lived by pretending to be mad and getting herself committed to the asylum on Blackwell's Island. She also investigated sweat-shop tenements by the same methods. 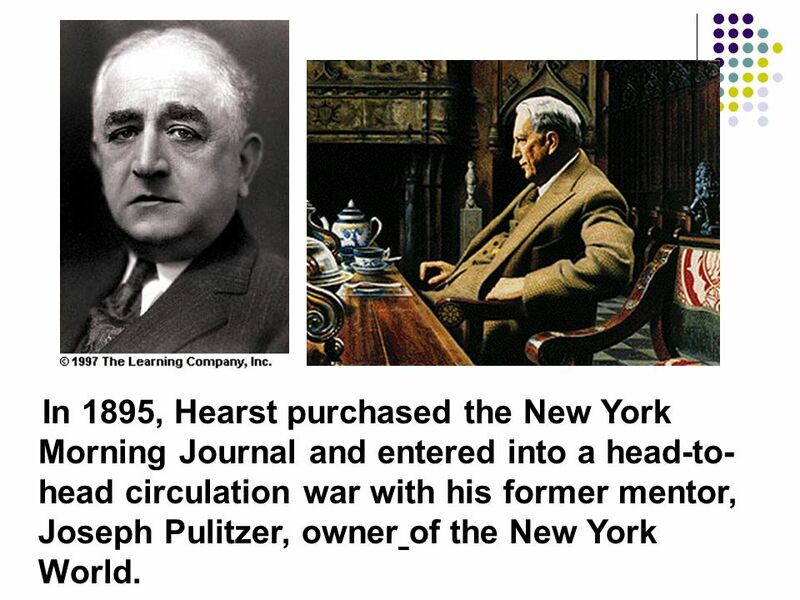 37 In 1895, Hearst purchased the New York Morning Journal and entered into a head-to-head circulation war with his former mentor, Joseph Pulitzer, owner of the New York World. 38 You should have taken notes on this information. 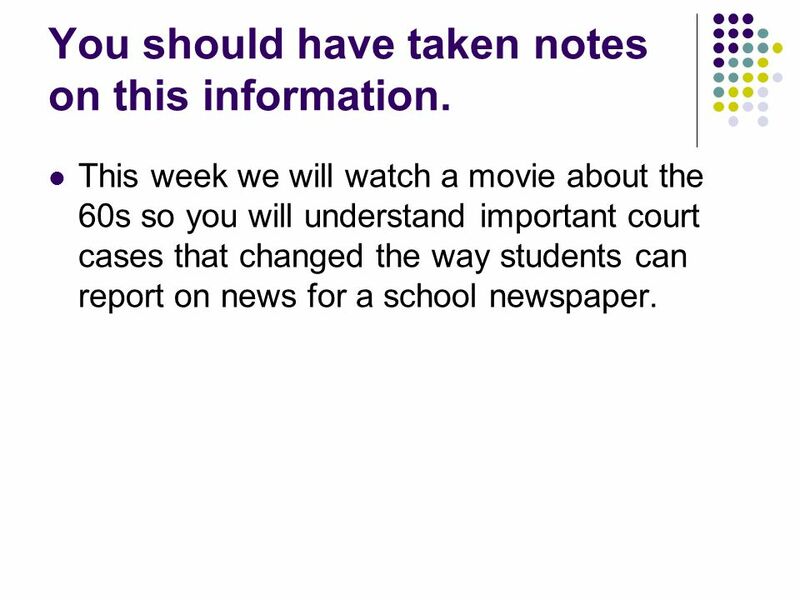 This week we will watch a movie about the 60s so you will understand important court cases that changed the way students can report on news for a school newspaper. 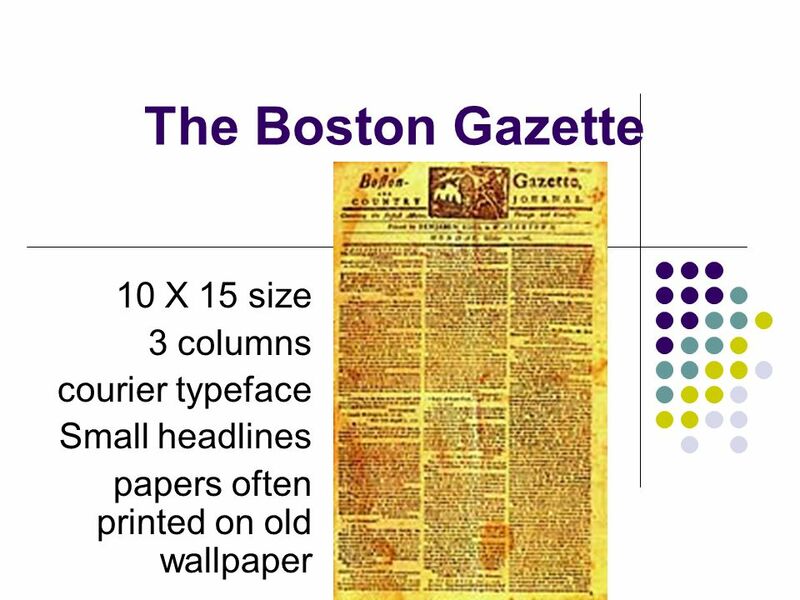 Download ppt "The First Newspapers in America"
HISTORY OF JOURNALISM SORT OF….. News reporting goes back thousands of years, perhaps to the first humans or even the first animals that could communicate. The Franklin Brothers Changing American Journalism Material property of the Arkansas Department of Education Distance Learning Center. It may be used for. 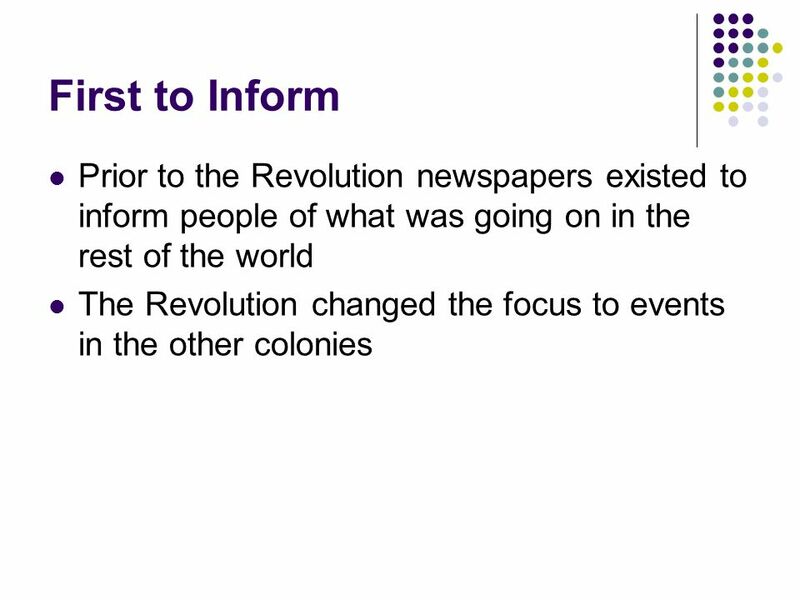 Media in Times of War American Revolution Civil War World War I World War II Vietnam Gulf War I & II. Press War Coverage. The Civil War The press flourished like it never had before during the Civil War. Revolutionary circa  Location Who?  Benjamin Franklin *  Thomas Jefferson *  Thomas Paine  Alexander Hamilton  James Madison  John. The Penny Press Material property of the Arkansas Department of Education Distance Learning Center. It may be used for educational, non-profit use only. Benjamin Day By: Jacob Hadsall John Henderson Early Life Born April 10, 1810, West Springfield, Massachusetts Died December 21, 1889, New York, New York. 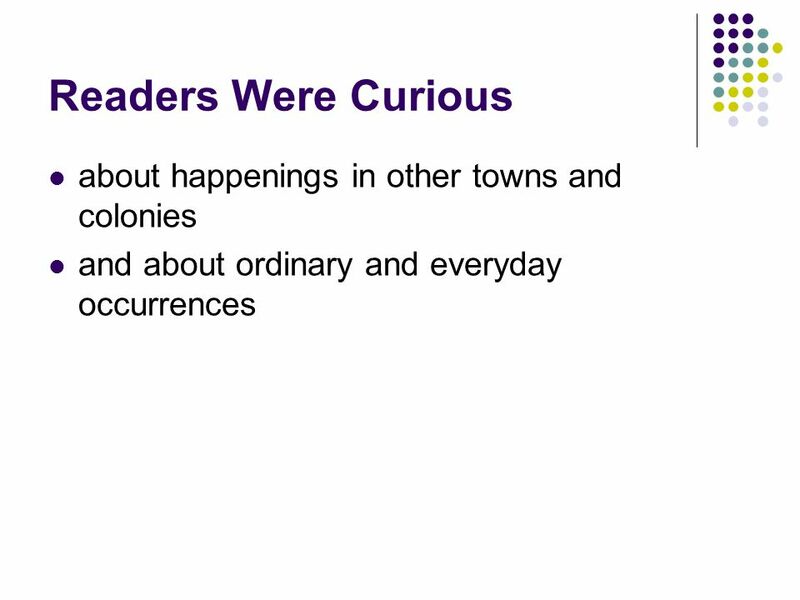 The History of American Media Chapter 1: Looking Back. 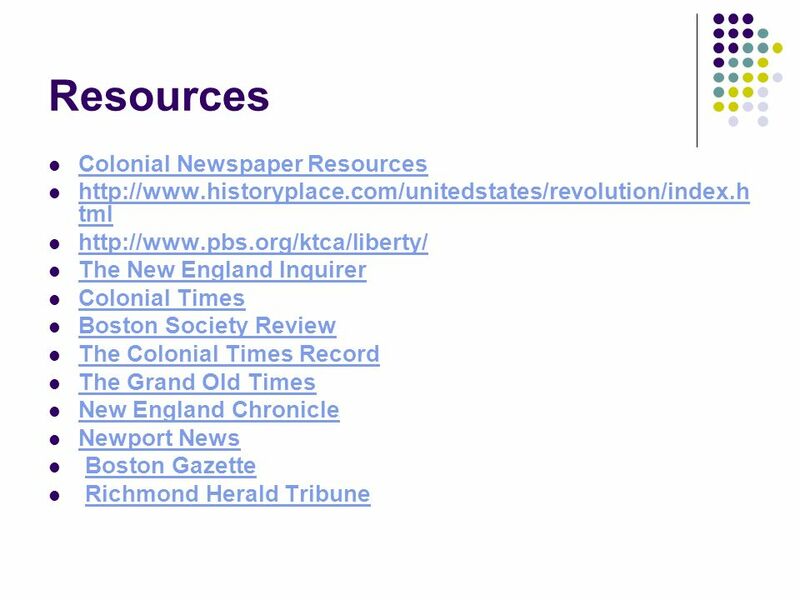 The Newspaper Timeline Newspapers Come to the United States Publick Occurrences Both Foreign and Domestick Publick Occurrences Both Foreign and. 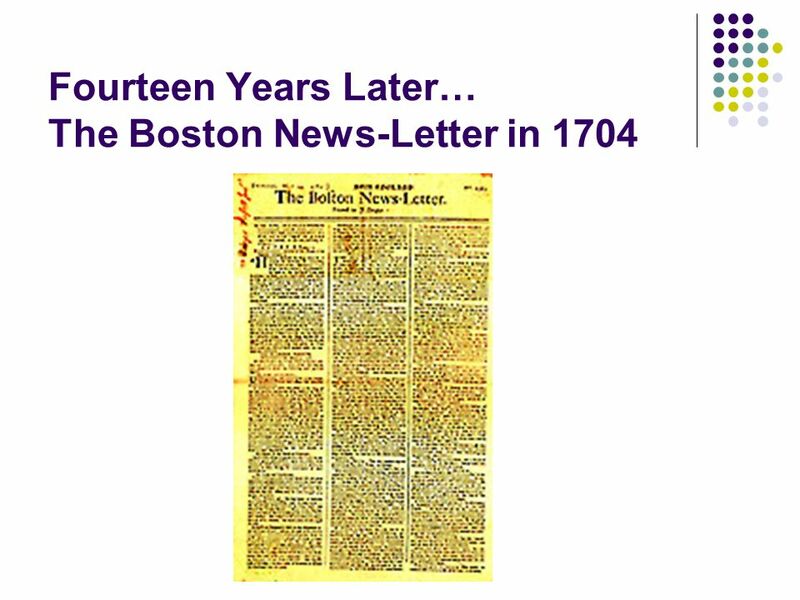 How Journalism Began Highlights of the history of journalism in the United States.